At The Mountaineers, our volunteers introduce people to the magical places we love so they'll feel connected enough to protect them. Give a gift to support this legacy. Remember the exhilaration you felt the first time you set foot on a mountain summit, snowshoed under a canopy of trees, or paddled in open water? Your experience not only shaped you, but also connected you to the place that made it possible. And I bet it's what inspires you to care for and protect it today. After Gabriella summited Mt. Rainier on a Mountaineers trip a few years ago, she started calling it "my Mountain" and began volunteering for trail projects in the park every year. It makes me feel good to know that Mountaineers volunteers are prepared to create moments of connection for all - and we look to champions like you to make these moments happen. 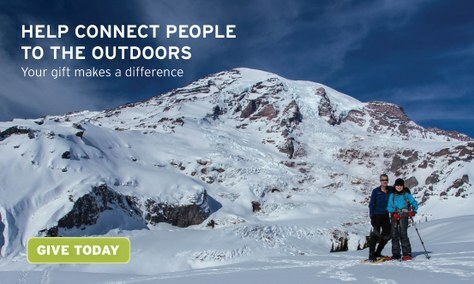 When you make your tax-deductible year-end contribution to The Mountaineers, you will advance volunteer, youth, and conservation efforts to introduce new people to the magical places we already love, so they'll feel connected enough to want to take care of them. We know we can do this. But we can't do it without you. Please give today to make this work possible. Thank you. P.S. Once you climb a mountain you don't see it in the same way ever again. This is the power of nature. Throughout its 110-year history, The Mountaineers has known this power and worked to connect people with the outdoors to enrich their lives and create protectors of iconic places that define our region. Your gift of $10, $110 or even $1,110 will help the next generation of Mountaineers see that they're part of a Pacific Northwest legacy.